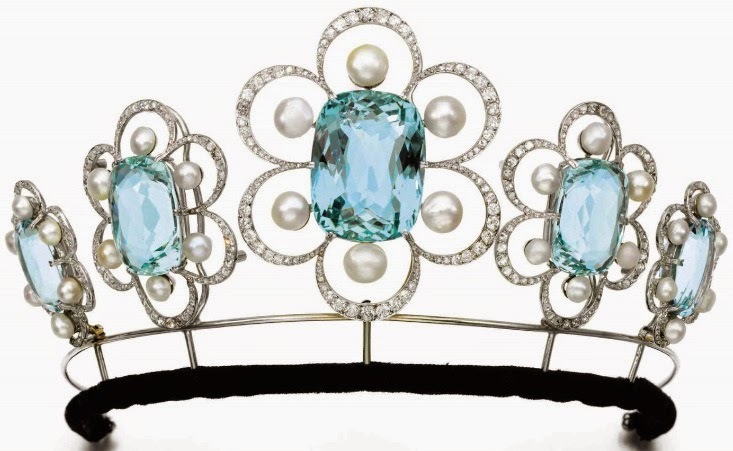 Creation: This tiara was created by Georges Fouquet in 1908 but was later altered by removing the enamel sections turning the tiara from a kokoshnik style tiara into a button style tiara. The five flower elements can be worn as brooches. What is this tiara's provenance prior to Duchess Katharine? Did Duchess Katharine actually own this tiara or was it loaned to her? Too bad the tiara was altered from its original version; it was gorgeous as a kokoshnik. Isn't that sad? At this rate, the Duchess of Kent won't have any tiaras left! Could it be they (the Dukes of Kent) need the money? I wonder if by doing this less inheritance tax maybe and historical one's be given to the crown to also avoid that same thing too.